I started riding at the age of fourteen. My dad would let me ride my brother's 1956 Vespa up and down the alley. When my brother went away to Notre Dame University and I was fifteen I would take it on out on Saturday mornings and ride around the neighborhood. This came to an end when I let Eddy White ride it with me on the back. He ran into a parked car, breaking my right leg. This ended the trips on the Vespa. 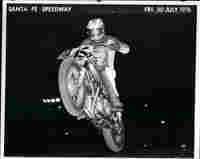 Later when I was seventeen, the summer of 1966, my friend, Art Knolls let me use his Honda 160 Scrambler. That was big fun. When I turned nineteen, I bought a 1968 Triumph Bonneville. I rode on the street with my buddies from TC's. Then one day, I went to Santa Fe Speedway with the gang from Ace Cycle World, this changed my life. Here is that story. 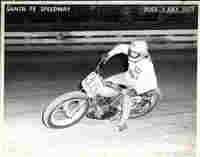 My last Dirt track racing sponsor was Ace Cycle World. It was the place to be in the 1970's. Here is the story about Ace Cycle World and the gang.